Jonathan Valladares’ family. Back, left: Father, Edilberto; brother Joshua; Jonathan; older-brother Elisha; sister Isabel; mother Michelle. Front: Siblings, Maria, Sarah and Benjamin. 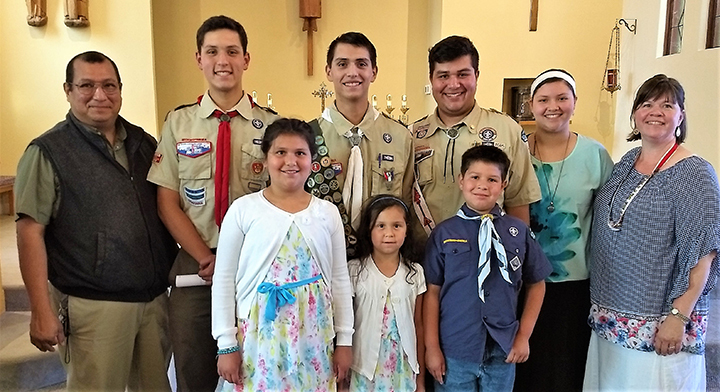 Silverton resident Jonathan Valladares reached the highest rank of scouting, earning his Eagle Scout designation, and was recognized for the accomplishment during an Eagle Scout Court of Honor, July 21 at St. Paul Catholic Church. He was presented the Eagle Scout badge by Troop 485 Scoutmaster Steve Potter, who reviewed highlights of Jonathan’s 12-year scouting career during the ceremony. Valladares began his “Trail to Eagle” as a six-year-old Cub Scout. Jonathan is a 2018 valedictorian graduate of John F. Kennedy High School in Mount Angel and was selected as “Senior Boy of the Year.” His leadership skills were recognized by the Boy Scouts of America organization in the awarding of the Eagle Scout rank. He amassed many Merit Badges along his way to achieving the Eagle ranking – a goal he set as a youngster. Dedication to duty eventually produced the distinguished Scout recognition. Jonathan also remembers many great times along his “Trail to Eagle.” However, he admitted, “Many of the important things I learned in Scouting came from times when I did not enjoy myself. In order to grow, you have to challenge yourself, which is not always the most enjoyable experience. Good experiences create good memories. But the most important experiences leave behind lessons about life. Jonathan also performed well during his years at Kennedy High where he excelled in advanced-placement courses and earned a 4.0 grade point average, Honors Diploma, and Oregon State Seal of Bi-Literacy. He was surprised on Kennedy High’s Senior Awards Night. “I really hadn’t come into the Awards Night expecting to receive anything. So, I was really surprised when I ended up receiving several department academic awards and community scholarships…plus the Senior Boy of Year award,” he said. He may have been surprised, the audience wasn’t. His signature virtue of humility was well-recognized by fellow students, coaches and staff at Kennedy High. This fall, Jonathan plans to attend Franciscan University in Steubenville, Ohio, where he will join his older brother Elisha.